Once you’ve gained a basic understanding of Twitter, you’ll soon begin wondering how to take it to the next level. The idea was simple: send a text to one phone number and that text would be broadcast to all of your friends. This was the founding of Twttr in 2006 - and no - that’s not a spelling mistake, that was the original name. As described in the first version of its website, “Twitter is a service for friends, family and co-workers to communicate and stay connected through the exchange of quick, frequent answers to one simple question: What are you doing?” The status update was born. These Tweets can include links to web pages, photos, videos, slideshows, and more. Some users will use Twitter as a way to reflect on their ideas, others will converse and some will simply use it to distribute information and reach an audience. Occasionally, you may see additional information and functionality appear below the icons. These are Twitter Cards, which we’ll cover later in the guide. In short, Twitter Cards deliver additional information whenever a web page is linked to it. As an early Twitter user, Chris Messina was attempting to organize a highly decentralized conversation. From the outside, it was difficult to see what users were commenting on or talking about, especially if they were in mid-conversation. The hashtag is a way of categorizing and organizing comments and messages. The hashtag convention was so effective that other social networks have since adopted it. Hashtags can be anything and everything from a brand name to a location so take the time to do some research and see what’s popular with your audience. As you build your marketing strategy and adopt new platforms like Facebook and Instagram, you’ll notice these hashtags are likely used there too. As mentioned earlier, your content strategy is how often you plan to Tweet and what types of Tweets you want to share with your audience. These are the Tweets that will keep your profile active, engage your audience, and help you attract new followers. You can take two approaches: content curation and content creation. Content curation involves finding content your audience will love and sharing it with them. Examples of content curation include finding videos, blog posts, news articles, memes, quotes, and similar content created by others, and sharing it with your Twitter audience. The benefit to a curation strategy is that your brand is regarded as an information source for relevant industry news. At the same time, it’s simple to find relevant information and share it with your audience. The drawback to this strategy however is that you are driving traffic away from your website. With so much information bombarding your audience, they may forget about you and move on. Content creation means creating videos, blog posts, news articles, memes, and similar content yourself and sharing it with your Twitter audience. Over time, you’ll be providing your audience with valuable content and driving traffic to your site. This strategy however, requires long-term creative investment in developing original resources and will take time to build your audience and see the return on investment. The route you take will likely depend on the amount of time you have to devote to your content strategy. You can also provide a mix of curation and creation to let your audience know that your goal is to inform them, whether it’s through your content or others’. Whichever route you decide to take, the content you share on Twitter should be relevant and useful to your target audience. Tweets about new concept cars introduced at a popular auto show, the latest episodes of shows related to cars like Top Gear or Counting Cars, or the winner of the most recent Formula One or Nascar race. Sharing content you have written on your automotive-focused blog. Engaging your audience by asking them questions related to cars, like “what would be your dream car?” or “what was the worst vehicle you ever drove and why?”. Sharing fun facts about automobiles, such as how Volkswagen produced the most passenger cars in 2013. Promotion of your latest products or services for automotive enthusiasts. The rule of thumb when it comes to valuable content sharing and self-promotion is 80/20. 80% of your updates should be interesting to your audience to help it grow and promote engagement, and 20% of your updates should be self-promotional for your business. 67% of consumers go to social media for customer service. 33% prefer using social media over traditional customer service channels like email or the phone. This means that you need to be looking for customer service opportunities on Twitter. 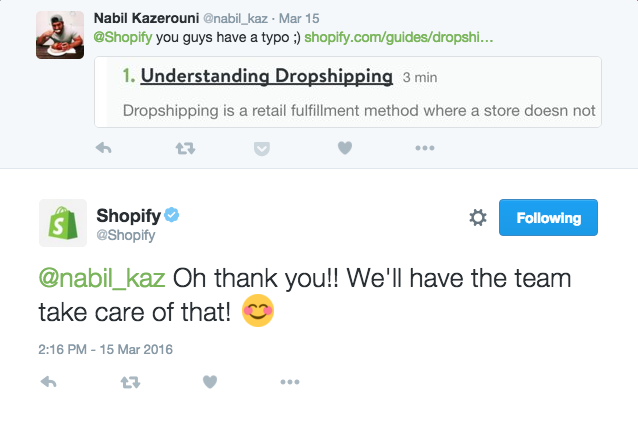 When customers Tweet you with a customer service issue, they expect a timely response. In some cases, it might be something you can work on without needing any additional information. In other cases, you might need to invite the customer to contact you for additional details, including sensitive data they shouldn’t share with the public. Either way, the goal is to respond quickly and create a solution that helps them avoid other support channels. For example, if you need them to email you, give them a personal email address as opposed to your general support email. Or, if you do give them the general support email, let them know that you are standing by to give them a fast answer. Your potential customers will love seeing you take care of your existing customers so be fast, be empathetic and make their day. One study shows that less than 3% of customer service Tweets actually mention a business’ Twitter username when Tweeting about their products or services. So in addition to monitoring the mentions of your Twitter username, you need to also monitor mentions of your full business name, unique product names, or unique service names. Not all of the results will be relevant to your business, but at least a few will require a response of thanks or customer support. By responding to these mentions, you may just surprise some people with your great brand management and customers service skills. You can use tools like TweetDeck and Hootsuite to search for your business name and unique keywords related to your business, products, and services. Mention can be used to monitor mentions of your business, products, and services on Twitter and other social platforms. These tools make it easier to find people talking about your business and respond to them quickly. The point of social media is to be social. People expect to connect with businesses and brands to engage with the people behind the scenes. There are many, many tools that can help you automate your Twitter presence. While it isn’t necessarily bad to schedule certain types of Tweets to your account, like sharing great content that you know your audience will love, you shouldn’t rely solely on automation tools to keep your account active. Any automation you use on your Twitter profile should be for the purpose of allowing you to have more time to interact with people on Twitter. Be sure to spend time answering people’s questions, thanking those that mention your business, helping those that need customer service, and so on. The more personal you make your Twitter account, the more meaningful of an experience you will have on Twitter. Direct messages, as mentioned earlier in the guide, are private messages you can send to Twitter users that follow you. Many tools suggest automating direct messages to new followers, but Twitter users can often find this action spammy and unfollow you for it. If you’ve decided to send automated direct messages, make them non-promotional as possible. Thank the person for following you, and maybe ask them a question to get the conversation started. Do not, under any circumstances, try to sell them, get them to click to your website, ask them to follow you or connect elsewhere. There are “rules” to Twitter you won’t find in the Support section of Twitter’s website. Here are a few things to keep in mind if you want to be loved in the Twittersphere. Oversharing happens in real life and it can happen on Twitter. You might be talking about something inappropriate or just something your audience doesn’t need to know. It may also have to do with your frequency. Try and avoid Twitter rants, people usually tune out or start trying to diagnose. If you walked into your favorite clothing store tomorrow, would you want the owner to come up to you and start talking about their lunch for 20 minutes? Probably not. Stay on topic. Yes, being real and personal can be endearing but there is a line to what your audience does and doesn’t need to know. Tweeting under the influence, it’s real and it’s dangerous. Not only does it hurt you, it can hurt those around you. Out for a big night out? Leave social media out of it. Your inspired joke might seem funny now but giving it a sober second thought is a real thing. And just because you think you’re Tweeting from your personal account doesn’t mean you actually are. Be safe. Isn’t that title annoying to read? Twitter amateurs will hashtag way too many words in their Tweet with the hope of getting noticed. Stick to 1-3 hashtags in your 140-character Tweet. No hashtags is totally cool too; not every thought needs a hashtag. Also, keep your hashtags simple. The goal is for them to be short and unique. #RememberEveryCharacterCounts. Sometimes you come across someone you know would be perfect for your product or service. Be cool. It’s okay to pitch someone on Twitter. It actually feels kind of nice for someone to be approached individually by a brand. The next thing a user will do when they get that message is look at your profile and see all your Tweets. 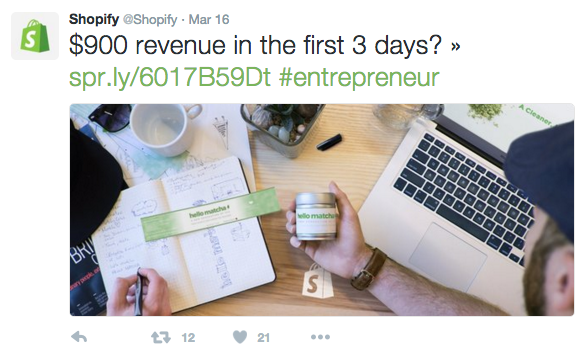 Too often, you’ll see companies with the exact same 140-character pitch to a hundred other Twitter users. This practice comes across as a blind, money-driven sales pitch that is quickly ignored and leaves a bad taste.